Whole in the Clouds is her first midd Kristine Kibbee is a Pacific Northwest native with a love of language, nature, and animals. Kristine’s passion for creative writing began in her early youth and led her to Washington State University, where she earned a degree with a concentration in professional writing. 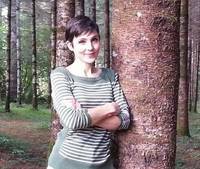 Kristine has since had works published in The Vancougar, The Salal Review, S/tick Literary Review, and she is a featured columnist in the nationally syndicated magazine, Just Frenchies. To ask K. Kibbee questions, please sign up. We’d love your help. Let us know what’s wrong with this preview of Forests of the Fae by K. Kibbee.